What makes the ambience of William Saroyan's The Time of Your Life so difficult to recreate is not only the specificity of the assorted tchotchkes answering the whim of the millionaire who holds daily vigil at Nick's waterfront tavern during the waning autumn afternoons of 1939, but their sheer volume as well: a fully-functioning pinball machine armed with bells, whistles, and patriotic anthems rewarding lucky gamers. A wind-up toy carousel, capable of drying the tears of homesick young women. A coin-operated phonograph a decade or two shy of being dubbed a "juke box." Let's not forget, either, a large supply of post-prohibition-era beer, wine, cigars and candy to be consumed on the spot. 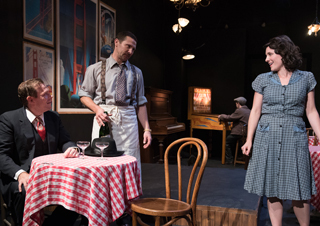 The Artistic Home is a small theater company with a likewise small budget, but their perseverance and resourcefulness is apparent in the production currently running at the West Town storefront. The pinball apparatus, for example, is a no-frills model rented from Northwest University's storage facility, but the "jackpot" display of flashing lights, a revolving wheel studded with waving flags and a robot version of "My Country 'Tis of Thee" represents the combined skills of designers Claire Sangster, Robin Miller, Zack Berenstein and Joseph Cerqua. The miniature carousel, reports director Kathy Scambiatterra, arrives courtesy of eBay. "It's not actual vintage, so Scott [Westerman, who plays Joe, the barroom benefactor] plugs it into a cord running up from the floor, hidden by the tablecloth. Fortunately, it makes its own music." Orchestrating activity around a fixed object is complicated enough ("I don't speak until almost three-quarters of the way into the play," says Joey Swift of his pinball gamester, "So this machine is my co-star for most of my time onstage"), but eating and drinking demand gastric stamina as well. The scene presenting the greatest challenge may be the gum-chewing contest between Joe and his manservant, the object being to see who can chew the most at once—a stunt performed with the aid of a donation by the Wrigley company of trademark product sufficient for the entire run. Says Jae K. Renfrow of his nightly dental exercise, "[After the show closes,] I never want to chew gum again! Smooth Mint isn't so smooth when you've got fifteen pieces in your mouth." Westerman agrees, "Speaking clearly around a mouthful of gum is a unique task for an actor, but what intrigues me more is finding my connection to all these different gewgaws that Joe has Tom fetch him—why these things, in particular? None are superfluous, or the playwright wouldn't have included them. Every object has to have its own meaning, its own story—and, in turn, help us to tell our story." The Time of Your Life runs at the Artistic Home through November 15.